Synopsis: Tim (Sean Lau) is an ambitious Narcotics Bureau chief inspector who puts his career above all else. Chao (Louis Koo) embeds himself in the depths of Hong Kong’s drug circuit as an undercover cop and barely resembles his former self. Wai (Nick Cheung) is Tim’s loyal subordinate who hopes that one day he can gain others’ respect through success. The three are life-long friends who would readily risk their lives for each other. But their new mission puts their brotherly bond to test. Verdict: Cheesy but emotionally poignant, with decent gun-and-brawl action despite the use of unconvincing and unwanted digital special effects (I prefer real fake blood, not digital crap), and a twist that I didn’t see coming. 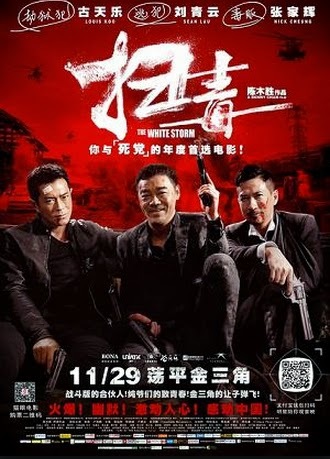 In overall, The White Storm is a better than average attempt to revive the spirit of Hong Kong action drama classics with friendship as the main theme, like A Better Tomorrow and Bullet in the Head. Influences of John Woo’s trademark corny over-the-top action sequences can be noticed, and with the inclusion of overused songs by HK movies/series like Amazing Grace and Sai Yiu Yap Dou San, one may wonder if part of the film’s intention is to pay homage to the golden era (the only problem’s that mediocre covers were used instead of the original tracks). 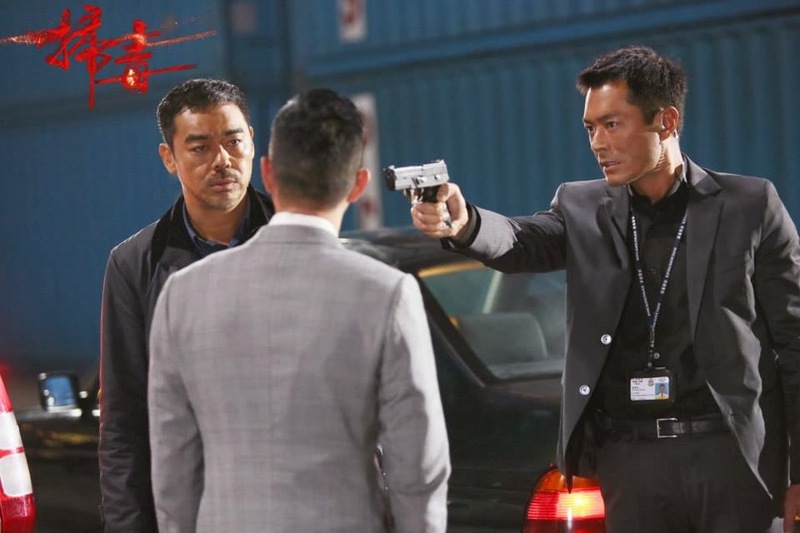 The three lead veteran actors start off with awkwardly weak acting but as the plot picks up, the stronger their performance become, particularly Sean Lau Ching Wan and Nick Cheung Ka Fai’s (you can see him doing a guillotine choke in one of the scenes, guess he’s putting the MMA skills he learnt from acting in Unbeatable to good use). Second opinion: My girlfriend liked it, the movie managed to get her eyes teared up. After the devastating scene where Tin (Sean Lau) is threatened by drug lord Eight-Faced Buddha (Lo Hoi Pang) to choose between Chow (Louis Koo) and Wai’s (Nick Cheung) life, I actually really thought that Wai has really died after being shot and expected Chow to be the evil one as story progresses before it’s revealed that Wai hasn’t died. And then the film actually managed to trick me again into believing that he’s after revenge on Tin and Chow, but what he’s really doing is to get all three of them to face each other with truthfulness and forgiveness. Pretty believable story, actually, Wai gets shot and falls into the crocodile river but manages to survive after swimming into the fallen vehicle for protection. He’s saved by Eight-Faced Buddha’s transgender daughter Mina (Treechada Petcharat), who falls in love with him for saving her previously. He has no choice but to use his relationship with her in order to stay alive in Thailand, not be killed by her father and gain enough trust just so that he could return to Hong Kong to reunite with Chow and Wai, and to plan his revenge on Eight-Faced Buddha. They’re pretty minor if you’re used to watching Chinese films, really. Here are a few examples; a bad guy hacks into police’s undercover files by simply guessing the access password, a character manages to CHOP his own hand off with an army knife (sawing/cutting would’ve been more logical), drug lord who’s portrayed to be consistently cunning in the story conveniently shows up in the end to be killed by the protagonists. Also, between these two, which do you think is more over the top? Malaysian censorship: Can’t recall any sequence being censored, not even the makeout sequence that apparently got Nick Cheung confused of his sexuality (spoiler on external link). To pay to watch? Yes, and if you do intend to, you might wanna try catching it at GSC 1 Utama’s cinema hall that has the newly installed Dolby Atmos surround sound system. The White Storm is the first ever film released in Malaysia that is screened with this advanced audio platform.